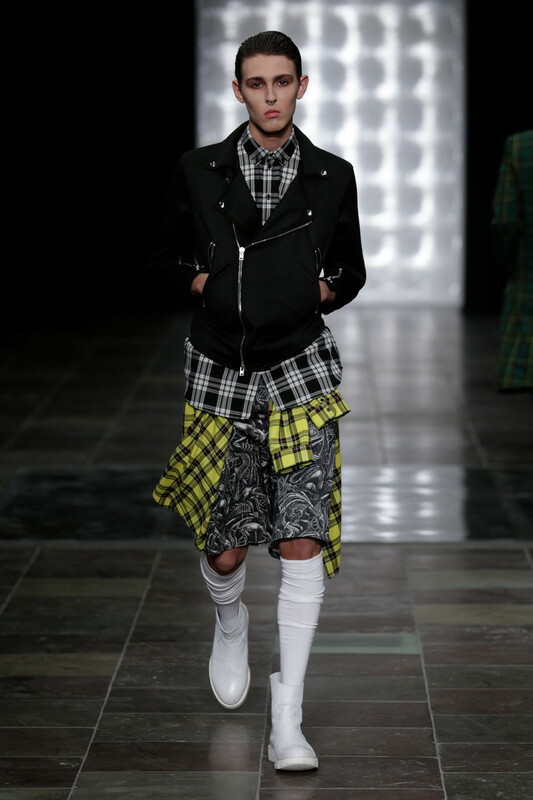 "We are very excited to get this opportunity to open the Copenhagen Fashion Week", those were Asger Juel Larsen's words and so was our feeling before his show. It was a great challenge for him, for such a young label who will soon be a truly established one (wanna bet?). In one year or so, we have seen his label grow, his bone-printed sweatpants travelling the world and having contributed to its expansion and particular place at the core of creation. Sportswear has a very important place for this label. Since the beginning, he launched mini-collections under the label A.J.L. Madhouse that offers a whole range of bone-printed sweaters and pants or (and isn't it a consecration?) with its name written in bold on clothes. These pieces have become basics, no need to discuss it. For his new collection entitled Triple Distilled Dream, for Spring/Summer 2014, Asger chose to open his show with his 4 favourite outfits, inspired by sportswear but with a clinical touch because, after all, you have to bear in mind that the story behind this show is young deranged guys escaping an asylum but finally wants to go back in. 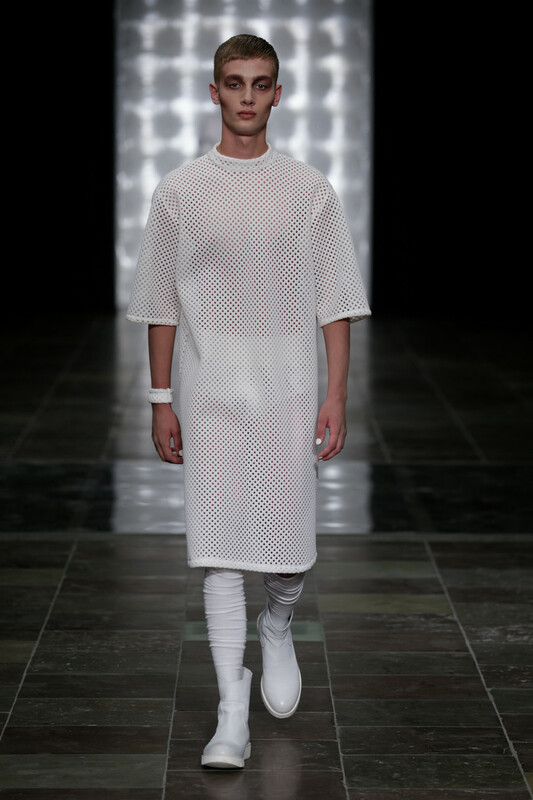 The models are wearing white perforated clothes such as a long tunic with loose sleeves, an oversized hoodie, boxy shorts with randomly zipped pockets, a body or briefs. 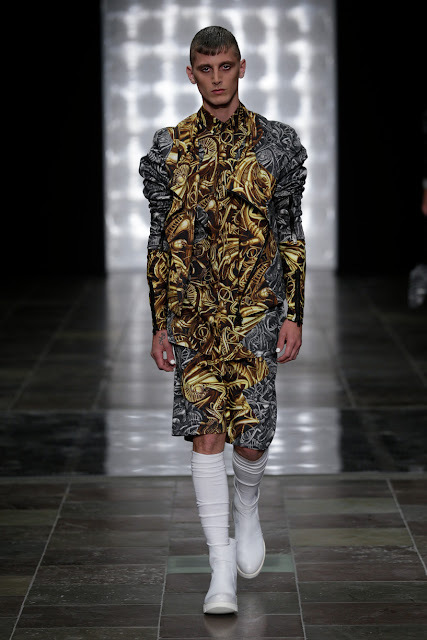 All these looks (and all the others of the collection) are combined with white boots reminding us of those worn by people working in morgues or slaughterhouses. This is the most litteral level of this collection. The following part is more intriguing and far more complex with the introduction of a new print. This print is a mix of pipes used to distil and bones giving us an impression of some kind of weird anatomy, something scary lying underneath. 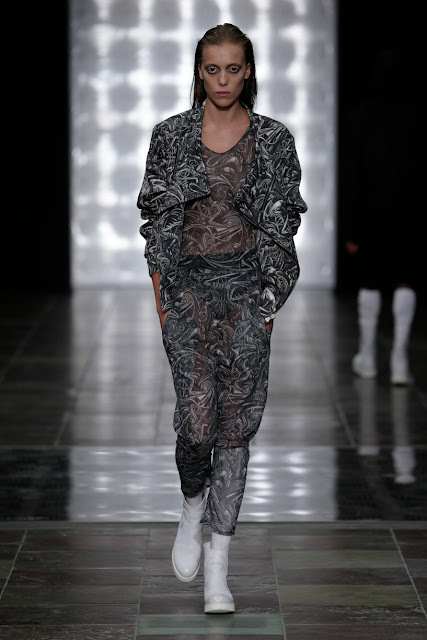 This time, chaos in the prints seems to be mastered, restrained and even softer than the previous collections. Materials are more sophisticated with for example the use of silk. 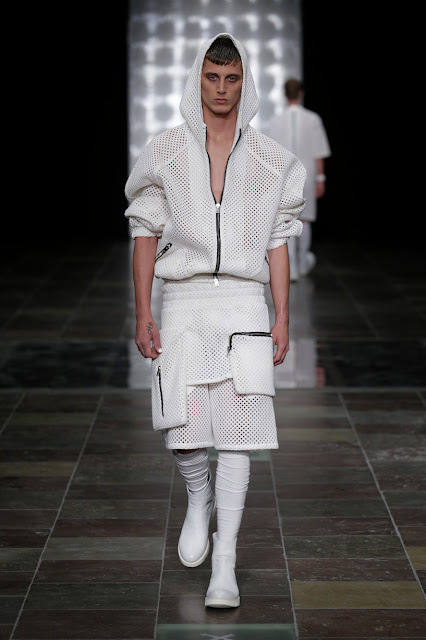 There is also a great work on the cuts emphasizing this refined aspect with tailored jackets, shirts and suits. Romance is not boring and not too far in Larsen's collections. Indeed, we can find the spirit of clothes for heroes (the punk legacy) with the beautiful tartans who are not classical in terms of colours. 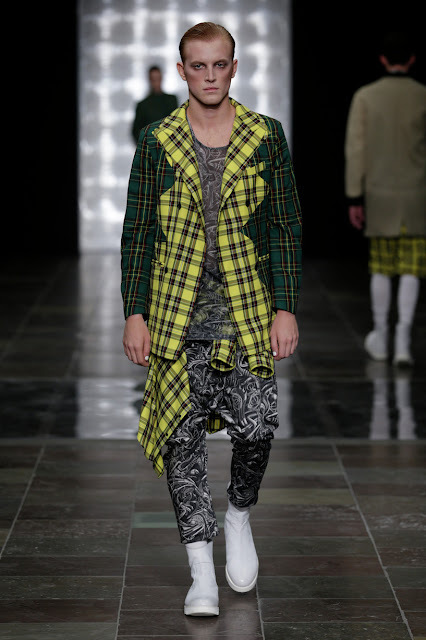 Here, Asger Juel Larsen gave it a more acid aspect mixing it with a more classical colour, the forest green. There is still this idea of balance between hard and soft, raw and refined or vintage and new in his work. Even the black tartan pieces are not so grungy, it's more than that and Larsen goes beyond the cliché proposing a beautifully tailored A Line coat. 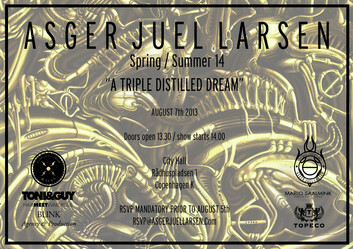 Now, you cannot say that Asger Juel Larsen is a label just for rebels or people on the fringe. You cannot say that his collections are always dark. 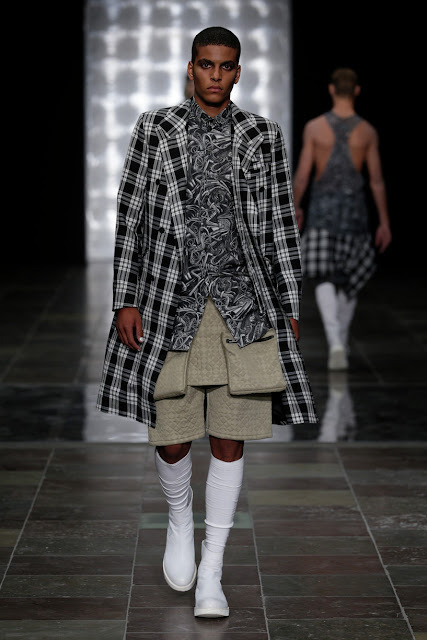 Ok, there is a particular aesthetics, you cannot deny it but with this SS14 collection, the Danish designer showed something more, something beyond the mere rebel figure, something weirdly cool that speaks to us more and more every day. These pictures can be found on the website of the Copenhagen Fashion Week.